Partly sunny skies are likely today with denser cloud cover south of the I-20 corridor. A few sprinkles will be possible across Central Texas through the afternoon hours. South winds of 10 to 15 MPH can be expected. There will be an increase in clouds during the overnight hours ahead of a weak cold front along the Red River. 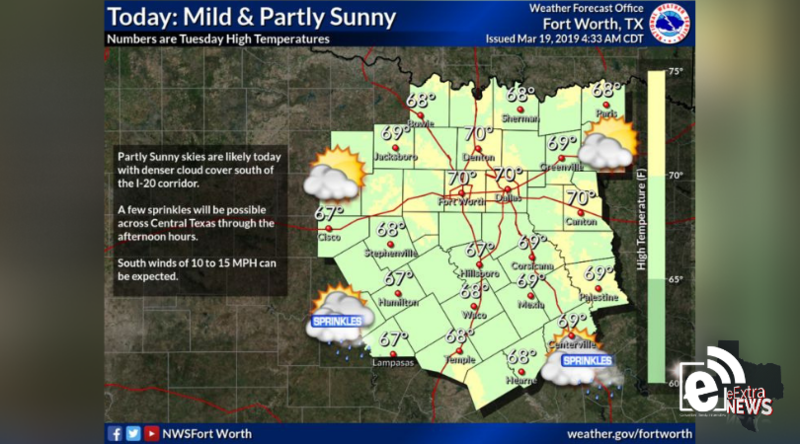 Low chances for rain showers exist for areas near and east of the I-35 corridor and north of I-30 around and just after sunrise Wednesday. Southwest to west winds are forecast with speeds less than 10 MPH. Overnight low temperatures will dip down into the 40s and 50s.